Hi there! I saw the job advert competition on NowGamer and immediately knew it was mine for the takings. OK! What do I do now? A web-log post of no more than 1000 words on a games related topic? Easy. You’re reading it. But maybe I should be introducing myself first. My name is Malachy and I want to write a bout games. It is a dream job competition. I love games as if they were my auntie Nell, who has taken care of me since my father died of exposure while digging for turf out in the bog. I love games this much. I love Mindjack and also The Halo 2. I love games so much that I am willing to write all about how great they are for none of the money, even though I have a first class degree in Neuroscience and Writing (it’s true!) and have written for many web-logs before. All I want is the exposure. Even though my dad died of exposure and I have an intense fear of it. That is how much I have love for games. Wow big words I know. But how is that a games-related issue? Well, I’ll tell you how. Lots of games have tackled this issue. Remember that bit in Mass Affect 2 where you go to the shiny planet run by Alan Sugar and everyone is playing the Stock Exchange and you go into a bar and there is a girl there who has not paid her debts and she has gone into indentured servicitude to pay them off? That is important! It is what they call in games an “ethical quarry”. Do you help the girl by convincing someone to buy her? Or do you tell her what she’s doing is wrong for her lifestyle choices and to become a better person? Who knows! Mass Affect 2 also has lots of funny looking people being racist to each other. 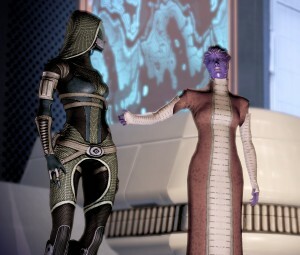 Here, the blue lady is calling the helmet lady a "quarian" - a derogatorish term for someone who often gets themselves into ethical quarries. On the one hand she will be working for nothing. On the other hand you will have called her stupid. It is a very difficult choice series. But if you think about it, it isn’t very nice to exploitify someone just because they owe you money for, say, some turf. And it is also not very nice to call someone a stupid for only being desperate, even if on the outside it looks like they are really really stupid. She is in trouble! You should be nice and help her! You can also get Paragon points for freeing the girl, which makes Commander Shepard more handsome. But this is not the only game that deals with in-dentist’s servitude. My favourite game ever is Bioshock. It is a very intellectuist game about shooting mutants in the face. And guess what! It has a whole big thing about slavery running through it the whole way! This is called a THEME. In my Neuroscience and Writing degree (first class it’s true!) I learned that THEMES are very important things in games and not just in books. The THEME of slavery in Bioshock is very complex and there is no easy way to describe it or “deconstructualise” it, as literary people might say. But I will try. Bioshock is also a game about "objectivism", which is a philosophy that believes only the main objectives of a videogame's mission should be completed and never the optional objectives because they are parasitic to enjoyfulness. 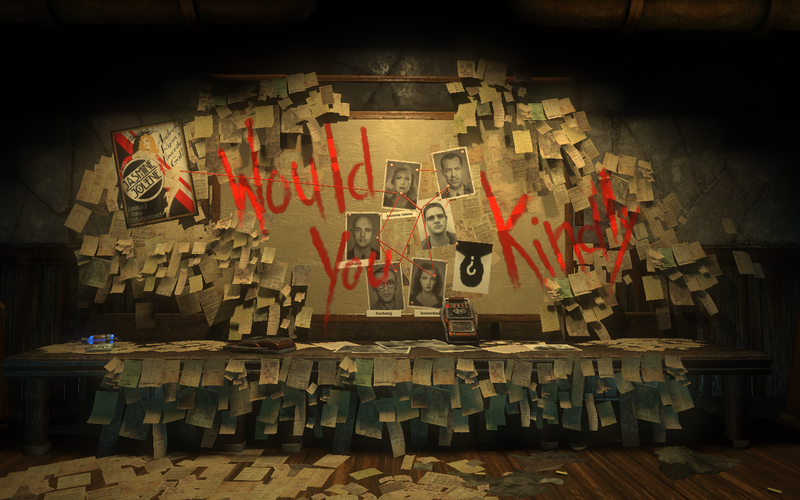 The whole way through Bioshock you are playing a game where you choose to kill or save little girls. It is like a side game but it is a good one because it gets you more mutant powers. This is another example of an ethical quarry. But near the end you discover that actually you have had no control at all over what you are doing and that the man who you trusted is actually a sneaky American pirate who is controlling you through hypnotists! Oh no this isn’t good, you might say. But actually it’s really clever! You see, the main baddie is called Andrew Ryan and the whole time he has been saying “A man chooses, a indentured servant obeys” or something like that. And then you see it’s true! He was a little bit right the whole time. Which is scary. The whole time you were doing something you thought you wanted to do, and something you thought was in your best interests but actually it turns out you were being exploited and manipulatated! That is a clever THEME. So there you have it. Too very interesting examples of indentured servitude in games, or as my hispanish Neuroscience and Writing professor that I met on the internet would say, “los video juegos”. I hope you have learned something about games by reading my web-log because I have had lots of fun writing it. I also hope that NowGamer consider me the right person for the job competition because I would love to write more about games for absolutely none of the money. Filed under Ethics, Ethics! Ethics? Two for a pound. Get your ethics here., Work! Now now, young Brendan, I think you are oversimplifying the issue for comic effect. Consider the other side of the story, think of the moneymen behind it all. For all your pomp and veiled indignation, you have neglected to recognise the fact that you are not their target audience. You, with your university degree and your ability to coherently string sentences together one after the other, and your total unwillingness to reply to the hundreds of emails sent your way by generous Kenyan generals, are simply ill-equipped for this prestigious blogging position. Do you know how difficult it is to consistently control the creative output of a man aware of the value of his work? Once they start asking for money, where will it end? I’ll tell you where it ends: with an army of converse training shoes stomping on the faces of suit-wearers everywhere, forever. Is that the sort of world you want? I don’t think you’ve thought this through. I don’t blame you. Your heart is in the right place, you’re just aimed in the wrong direction. Stop thinking about dignity, that’s where success lies. You are far more likely to acquire gainful employment if you stop rocking the boat and just settle in for the long haul. Do what you’re told, and pay for the privilege. That’s the future, my friend. Pretty sure you mean “ethical quandary”. A quarry’s where you mine stuff, or your prey, init.